Just fitted and seems to fit description - cannot judge long term durability at this time. Item arrived on time, well packed and with good instructions regarding venting and installing. Would strongly recommend Tanya. Great Service once again. Delivery within 24 hours. Fitted in my caravan and the charge is holding well although I have not been away in the van since fitting the new one. 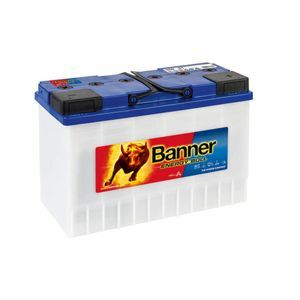 My last Banner Bull battery lasted almost 5 years, with quite heavy motor mover usage, so I will be pleased if this one does the same. Excellent service, ordered late on a Friday and delivered before 3pm on the Monday. Prompt delivery after hiccup on delivery address/payment. Batteries seem good so far. I bought this battery as a replacement for a six year old Banner battery that had finally failed, I will be delighted if this one lasts as long! So far so good, battery arrived within hours of me ordering it and came complete with a new vent tube. Brilliant service well done Tanya. Great value. Delivered next day. Excellent customer service and delivery. Battery needed charging for 3 hours before I could fit it. Tried once with caravan and motor mover, no problems. A little hard to fully review as yet, but it is as described, time will tell in respect to longevity and quality.. Item arrived very well packaged and in a very timely manner. Great product, excellent service. I purchased the 95901 to replace a poorly performing 59201 AGM purchased from Tayna in 2015. As before, the service, packaging and delivery by Tayna were excellent. However, I have some doubts about the build quality of this wet battery. On receipt, in undamaged condition and with the cells topped up, I attempted to charge the battery with my trusty CTEK MXS 7.0. I could not get the battery beyond stage 4 (absorption) of 8 stages whereas the charger eventually went to stage 8 with another battery, thus eliminating a charger fault. I then placed the battery into my Rapido motorhome which also has a sophisticated charger set to 'wet battery'. The voltage on charge was a steady 14.2 volts. Off charge after 4 hours the voltage was 12.7 which seems to indicate fully charged. I have yet to try the battery overnight off-grid but I doubt I will ever buy another Banner battery; they have both been problematic. The service I received from you was excellent and the delivery company palletways from start I was able to track them each step of the way. I think the service from start to finish was outstanding.